The Department of Defense announced today the death of 12 soldiers who were supporting Operation Iraqi Freedom. 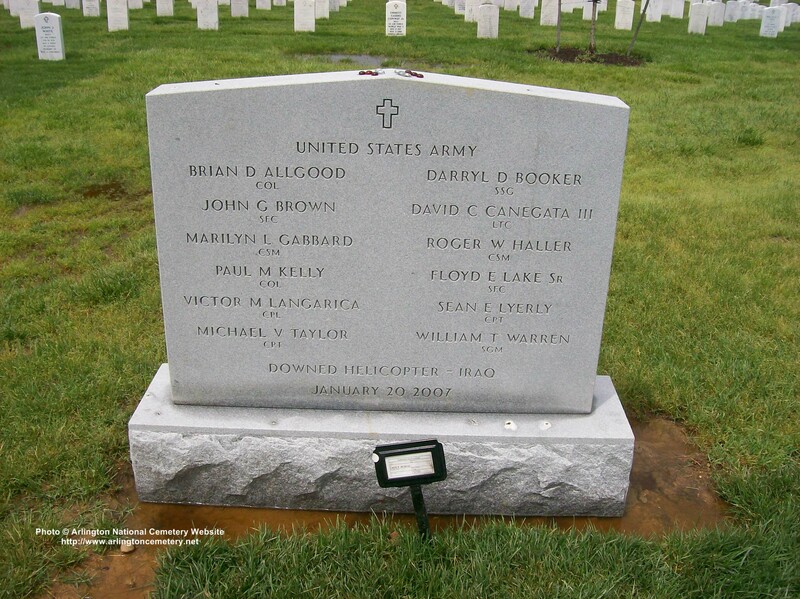 They died in Baghdad, Iraq, on January 20, 2007, when the UH-60 Black Hawk helicopter they were in crashed. Colonel Brian D. Allgood, 46, of Oklahoma, who was assigned to the 30th Medical Brigade, Europe Regional Medical Command, Heidelberg, Germany. Staff Sergeant Darryl D. Booker, 37, of Midlothian, Virginia, who was assigned to the 29th Infantry Division, Virginia Army National Guard, Sandston, Virginia. Sergeant First Class John G. Brown, 43, of Little Rock, Arkansas, who was assigned to the Arkansas Army National Guard’s 1st Battalion, 185th Aviation Regiment (Air Assault), 77th Aviation Brigade, Camp Robinson, Arkansas. Lieuetnant Colonel David C. Canegata III, 50, of St. Croix, U.S. Virgin Islands, who was assigned to the Virgin Islands Army National Guard, Christiansted, U.S. Virgin Islands. Command Sergeant Major Marilyn L. Gabbard, 46, of Polk City, Iowa, who was assigned to Joint Forces Headquarters, Iowa Army National Guard, Camp Dodge, Johnston, Iowa. Command Sergeant Major Roger W. Haller, 49, of Davidsonville, Maryland, who was assigned to the 70th Regiment, Regional Training Institute - Maryland, Maryland Army National Guard, Reisterstown, Maryland. Colonel Paul M. Kelly, 45, of Stafford, Virginia, who was assigned to the Joint Force Headquarters of the Virginia Army National Guard in Blackstone, Virginia. Sergeant First Class Floyd E. Lake, 43, of St. Thomas, U.S. Virgin Islands, who was assigned to the Virgin Islands Army National Guard, Christiansted, U.S. Virgin Islands. Corporal Victor M. Langarica, 29, of Decatur, Georgia, who was assigned to the 86th Signal Battalion, Fort Huachuca, Arizona. Captain Sean E. Lyerly, 31, of Pflugerville, Texas., who was assigned to the Texas Army National Guard’s 36th Combat Aviation Brigade, 36th Infantry Division, Austin, Texas. Captain Michael V. Taylor, 40, of North Little Rock, Arkansas, who was assigned to the Arkansas Army National Guard’s 1st Battalion, 185th Aviation Regiment (Air Assault), 77th Aviation Brigade, Camp Robinson, Arkansas. First Sergeant William T. Warren, 48, of North Little Rock, Arkansas, who was assigned to the Arkansas Army National Guard’s 1st Battalion, 185th Aviation Regiment (Air Assault), 77th Aviation Brigade, Camp Robinson, Arkansas. For information on Langarica, the media can contact the Fort Huachuca public affairs office at (520) 533-2752. For information on Lyerly, the media can contact the Texas National Guard public affairs office at (512) 782-1034. Captain Sean Edward Lyerly, 31, of Pflugerville, Texas, was killed in action January 20, 2007 while serving on Active Duty in Iraq. He was a crew member on a UH-60 Blackhawk helicopter involved in a crash. Circumstances concerning the downed aircraft are pending investigation. Captain Lyerly entered military service as a Private in the Texas Army National Guard on October 26, 1996. He graduated from Stratford High School in Houston, Texas, in the summer of 1994 and earned a Bachelor of Science Degree in Horticulture from Texas A&M University in May of 2000. He completed Advanced Individual Training as a Cannon Crewmember at Fort Sill, Oklahoma, on August 22, 1997, and was advanced in grade to Private E-2 before enrolling as a Cadet in the Reserve Officers Training Course (ROTC) at Texas A&M University. While at Texas A&M, he was a member of Company L-1 in the Corps of Cadets. Captain Lyerly successfully completed the U.S. Army Aviation Officer Basic Course on March 24, 2005 and the UH-60 Aviator Qualification Course on June 14, 2005 at Fort Rucker, Ala. He was promoted to Captain on December 30, 2005, and served as Commander, HHC 2nd Battalion 149th Aviation, Austin, Texas. 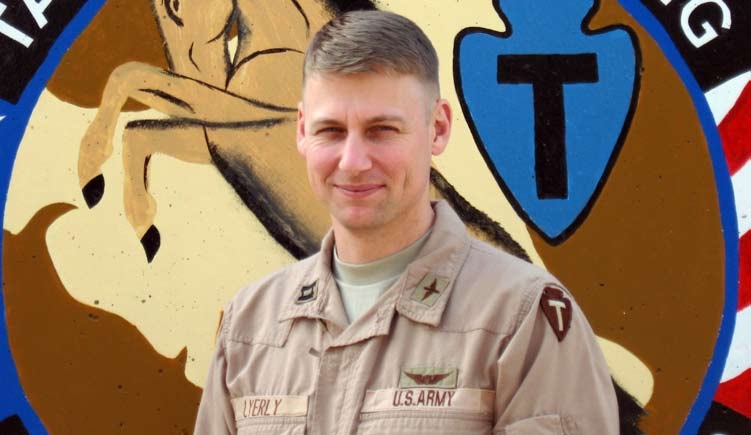 Captain Lyerly was ordered to active duty on February 1, 2006, in support of Operation Iraqi Freedom (OIF) and deployed with his unit, the 36th Combat Aviation Brigade, based in Austin, Texas. The unit spent six months at Fort Hood, Texas, conducting training in preparation for its overseas mission. The unit arrived in the OIF area of operations in August 2006. Its assigned mission was to provide aviation support and security throughout the combat zone. Captain Lyerly flew on several missions in support of Operation Iraqi Freedom. Captain Lyerly’s awards and decorations include the Army Aviator Badge, Army Service Ribbon, National Defense Service Medal with Bronze Star, Reserve Components Achievement Medal with M Device, Army Achievement Medal with Oak Leaf Cluster, Army Commendation Medal, and is being recommended for the posthumous award of the Purple Heart and Bronze Star Medal with V Device for his selfless service and acts of heroism and valor. Captain Lyerly is survived by his wife Csilla and their son Zackary, 3, of Pflugerville; mother Deborah Russo-Blakeman and husband John of California; father George Lyerly '67 and wife Monica of Bryan; grandmothers Virginia Lyerly of Caldwell and Elvina Rachal Russo of Louisiana; brother George Edward Lyerly, Jr. of Bryan; and godfather Louis Russo of Louisiana. Captain Lyerly will be remembered Sunday, January 28, with a wake and visitation from 5-7pm, followed by a vigil service at 7pm at Cook-Walden/Capital Parks and Funeral Home, located at 14501 North IH-35 in Pflugerville, 78660. A funeral service will begin at Noon Monday, January 29 at St. Elizabeth Catholic Church, located at 1520 N. Railroad Ave. in Pflugerville, 78660. Burial will follow at Capital Parks. Friends of Sean Lyerly and the Lyerly family are invited to a reception immediately following the burial at St. Elizabeth Catholic Church. Born: June 4, 1975, Captain Lyerly is survived by hiswife, Csilia, son, Zack, and parents George and Deborah Lyerly. assignment as an aviation officer was in 2nd Bn., 149th Aviation Regt., as the HHC commander. On Dec. 1, 2005, he was promoted to captain. He transferred to HHC, 36th Combat Aviation Brigade, as the liaison officer and then was mobilized on Feb. 1, 2006, in support of Operation Iraqi Freedom 06-08, where he worked as the training officer during pre-mobilization training at Fort Hood, Texas. He served as the night shift battle captain for the brigade while stationed in Balad, Iraq. 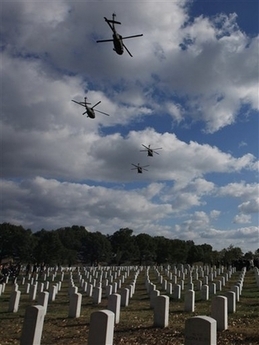 Twelve soldiers who were killed on January 20, 2007, when their UH-60 Black Hawk helicopter crashed in Baghdad will be honored during a group interment at Arlington National Cemetery. 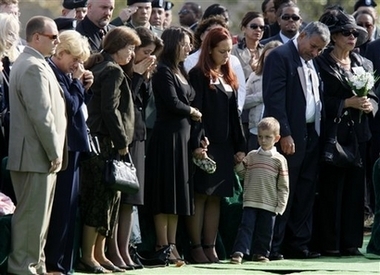 The ceremony will begin at 9 a.m. October 12, 2007. The soldiers, who belonged to a number of active Army and Army National Guard units, are: Colonel Brian D. Allgood, 46, of Okla. Colonel Paul M. Kelly, 45, of Stafford, Virginia, Lieuetnant Colonel David C. Canegata III, 50, of St. Croix, U.S. Virgin Islands, Captain Michael V. Taylor, 40, of North Little Rock, Arkansas, Captain Sean E. Lyerly, 31, of Pflugerville, Texas, Command Sergeant Major Marilyn L. Gabbard, 46, of Polk City, Iowa, Command Sergeant Major Roger W. Haller, 49, of Davidsonville, Maryland, First Sergeant William T. Warren, 48, of North Little Rock, Arkansas, Sergeant First Class Floyd E. Lake Sr., 43, of St. Thomas, U.S. Virgin Islands, Sergeant First Class Class John G. Brown, 43, of Little Rock, Arkansas, Staff Sergeant Darryl D. Booker, 37, of Midlothian, Virginia, and Corporal Victor M. Langarica, 29, of Decatur, Georgia. After the ceremony, Lieutenant General Clyde Vaughn, director of the Army National Guard, will host a reception for all 12 families at the Army Guard's Readiness Center in Arlington, Virginia.